Chart your course for ad­venture along Fairfax County trails this summer, and you may cross paths with Matt Liddle. The self-professed outdoor lover and regional REI partnership and philanthropy manager makes it his business to know, promote and help preserve public lands where he works and lives. “It’s a huge part of REI’s DNA,” he said. Liddle’s passion for the outdoors is rooted in the Pacific Northwest where he grew up. After moving to the D.C. area nearly a decade ago, he was inspired by the region’s many outdoor recreation options. 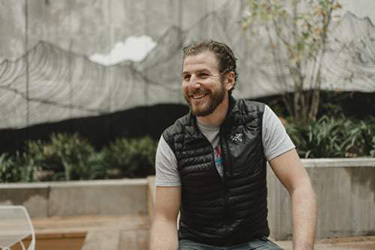 His personal quest includes a professional compo­nent in fulfilling REI’s purpose-driven commitment to increase access to outdoor recreation. Thanks to a generous REI grant through the Fairfax County Park Foundation, Fairfax County’s trail system now includes 15 new way-finding signs to help outdoor enthusiasts navigate their way on and off the 41-mile GCCCT. 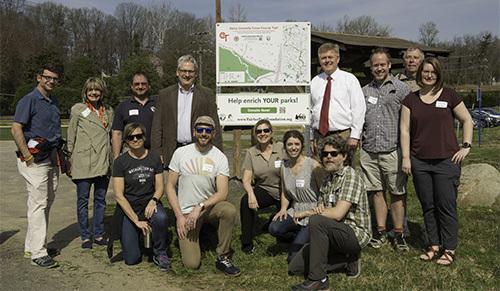 The Fairfax County Park Authority way-finding project ties in nicely with REI’s vision to inspire, educate and outfit for a lifetime of outdoor adventure and steward­ship. It’s a shared vision among the nation’s largest con­sumer cooperative’s 17 million members who volunteer their time and provide company resources to ensure the next generation has a first-hand connec­tion to natural spaces.